It's apple crafting time! Can you smell the change of seasons happening? Back to school is happening around the country and we are celebrating by crafting a whole bunch of apples! Gather all of your craft supplies and choose one or more of these great back to school apple crafts to try. After you're finished, have your kids gift them to their new teachers or pass them out to their friends at school. These popsicle stick apples are super fun to make with your kids. Simple, cute, and a great back to school tradition for your family. I love the dimensions of this tissue paper green apple craft. The final product is adorable. Hang these in your home for back to school and fall! This apple craft looks good enough to eat! But this craft if just for making and looking at. Use shaving cream to make your own puff paint. Decorate with sprinkles and you're done! Who knew that lacing yarn through a paper plate could turn out so darling? Help your kids get started on this craft and watch them finish lacing all by themselves. Give your teacher a bouquet of apples with this idea. Easy, totally cute, and a healthy treat! Try a different crafting/painting technique with this marble painted apple craft. You'll need marbles, paint, and construction paper. Make a yummy after school treat and top them with these adorable DIY apple cupcake toppers. Save them for a back to school party or reuse them every year. Little crafters will love making these sweet apple napkin rings. Serve a pancake breakfast for back to school on these DIY apple plates. This will help get your kids excited about starting school again. 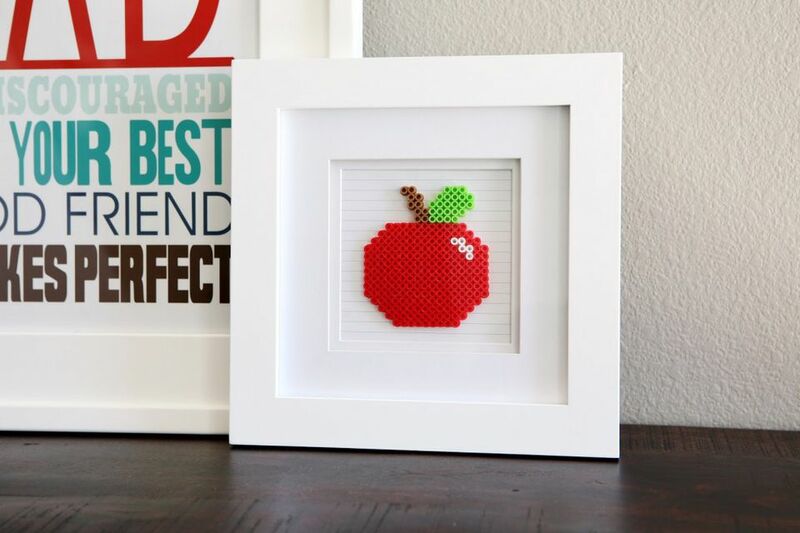 Make this framed peeler bead apple craft to hang in your house for back to school month. It's perfect for fall time also! This apple project is so simple that even your littlest crafters can do it. Grab some pipe cleaners and start bending them to make apples.